25 parts in grey styrene, plastic base in red-brown coloured plastic. Excellent sculpting; generally very good moulding; popular subject. Prominent seam down the middle of the face will nead some cleanup. Recommended to WWI and large scale figure fans. In addition to their large range of 1/35 scale vehicles, figure sets and buildings, MiniArt also offers a range of large scale 1/16 figures. The subjects range from the Classical Greek period, through Roman, Medieval, the Napoleonic era and WWI. Three of the figures are dedicated to famous WWI aces Ernst Udet, Hermann Goering and “The Red Baron”, Manfred von Richthofen. 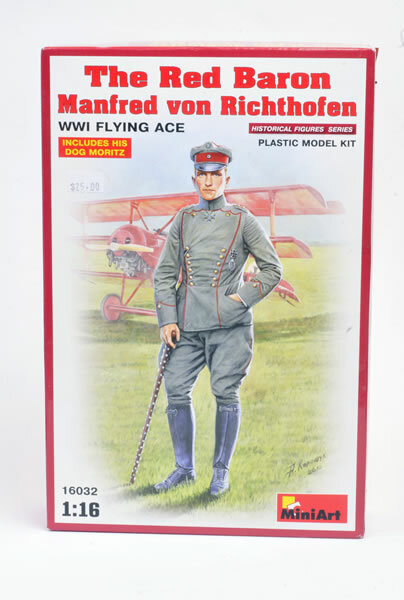 The 1/16 scale Red Baron figure includes the pilot himself, leaning on an ornamental walking stick, and his deerhound Moritz, although the big dog does not appear on the box art. 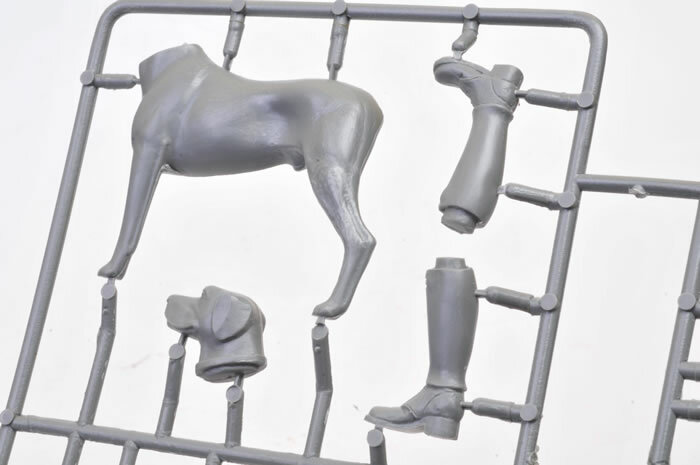 The set comprises just 25 pieces in grey plastic covering the man and his hound. 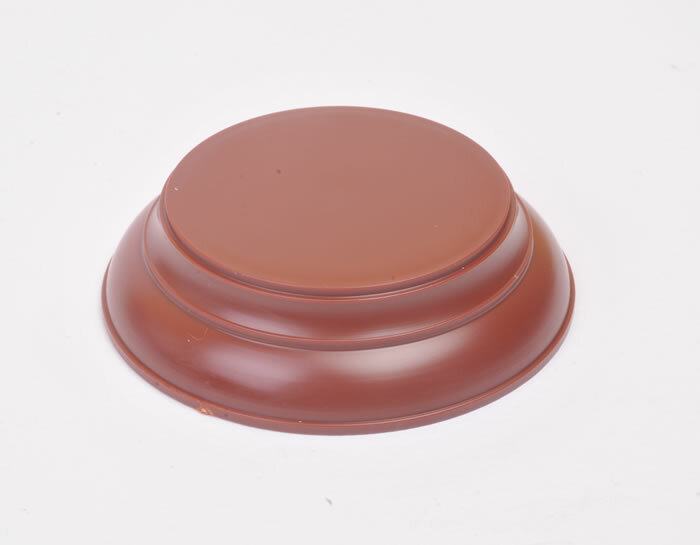 A small circular base in reddish coloured plastic is also included. This is big enough for von Richthofen, but the dog won’t fit. Moulding quality is generally good and detail is excellent, but you’ll want to glue the pieces together carefully to minimise join seams in prominent places. Medals and epaulets are moulded as separate parts. 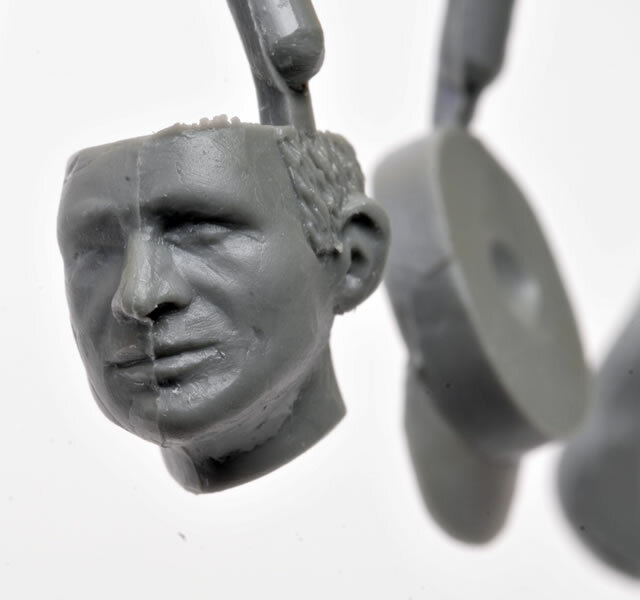 Oddly, the head is moulded sideways on the sprue meaning that there is a large raised moulding seam right down the middle of the face. The detail on the left side of the face seems softer than that on the right side too. In summary though, after spending a bit of time cleaning up the face, this should be a large and impressive display piece.